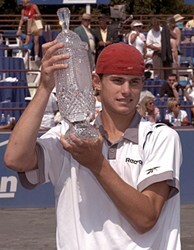 Andy Roddick with trophy in 2001. ATLANTA, July 15, 2010 – Andy Roddick, America’s top men’s player, has accepted a wild card into the Atlanta Tennis Championships. Roddick won the last ATP World Tour tournament in Atlanta in 2001. The Atlanta event, owned and operated by USTA Southern, will serve as the kick-off to the 2010 Olympus US Open Series. On Apr. 29, 2001, the 18-year-old Roddick was ranked No. 89 when he defeated Belgian Xavier Malisse 6-2, 6-4 in the Atlanta clay court final. He was the first American teenager to win an ATP title since Michael Chang in 1992. The Atlanta Tennis Championships will feature a 28-player singles draw and 16-team doubles draw. Roddick joins John Isner, Lleyton Hewitt, James Blake and Robby Ginepri in the main singles draw. Concurrently, the men’s winners from 16 US Open National Playoffs Sectional Qualifying Tournaments will battle for one spot in the 2010 US Open Qualifying Tournament in Flushing, N.Y.